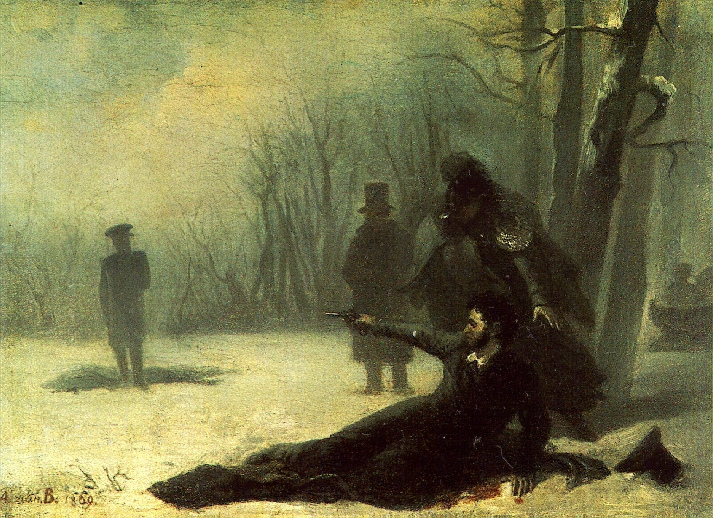 Short firearm rarely played a leading role, apart from merely few periods. From its very beginning, it was usually just a supporting element of the armament, although in fact it has a quite important meaning in close combat. Even the first guns allowed for shooting an enemy away from 100 metres, but with minimal chance of hitting him. As the time went, little has changed in this regard, despite the significant increase of the range of revolvers and pistols. The flintlock pistol was the first weapon of this kind. Its mechanism was based on a circle with a rough surface, which was rubbing pyrite while it rotated. In this way, sparks were struck, firing the priming on the cup. The main advantage of this lock (also called simply a circular one), in comparison with the equally widely used matchlock, was the fact that this weapon could have been at any time prepared to shoot in advance and kept in such state for a long time, strapped to the horse saddle for example. Hence, flintlock was mainly applied to pistols, while in the case of rifles, the matchlock mechanism performed better. The circular lock was invented in the first half of the sixteenth century. There were attempts to popularize it as widely as possible, but due to a high cost of production and a very complex lock mechanism, it was not accepted in general use at that time. Therefore, in the sixteenth and seventeenth centuries, the matchlock was much more commonly used, as it was cheaper, less complicated to deal with and easier to repair. At the beginning, a gun was a luxury item, which could only be afforded by the most wealthy. In the sixteenth century, it started to be more accessible and in the seventeenth century there were already many units fighting with short firearms. It was most often used by cavalry then, especially in formations of dragoons and the Reiters. With the beginning of the seventeenth century, guns became the primary weapon for the troops using the caracole tactics. Short firearms were mostly popular among the horsemen troops due to the fact that fighting with a rifle was more difficult for them, especially when it comes to reloading. In the second half of the seventeenth century, firearms (especially pistols) became much simpler and cheaper, thanks to the flintlock mechanism having been applied. In the sixteenth and seventeenth centuries, cavalry sought for the most appropriate tactics that would make the widespread use of firearms possible. At first, it seemed that thanks to the replacement of melee weapons with firearms, the horsemen would be able to achieve much better results in battles. It was assumed that with a gun or a long-barrel weapon (such as an arquebus), the opponent could be effectively injured before his getting close to strike with a melee weapon. However, in reality it turned out that running fire during horseback riding, particularly when it comes to reloading, is an extremely difficult task. The firepower of the infantry has always exceeded the horse shooters. So with time, they returned to the old way of charging at the troops using melee weapons This process concerned the cavalry in Western Europe, but never took place in the case of the Eastern type cavalry, i.e. in such countries as Poland or the Ottoman Empire. The horsemen of these armies successfully kept on applying charge and fight in cold weapons. As a result, they always prevailed the Western European cavalry in this regard, even when it returned to the use of such methods of warfare. On the other hand, it does not mean that Eastern horse troops have never used any handguns. Actually, they have, but almost always in the form of a secondary weapon. This was the direction evolution aimed at in the eighteenth century. The flintlock provided for a new quality of pistols, but cavalry rather focused on the development of the charge at troops using melee weapons than on the methods of firearms' usage. The Napoleonic wars were the highlight of their development. From that moment on, firearms (mainly long-barrel guns) grew fast and the traditional methods of cavalry warfare began to lose its importance. The horsemen started to be equipped with rifles and pistols again. The powder on a priming was fired thanks to the sparks which appeared as a result of hitting one piece of flint, placed in the jaws of a tap, with a metal plate attached at the right side, what was a kind of a tinderbox. When the trigger was pulled, the flint fell, rubbing this tinder. The sparks which appeared in this way, fired the powder on a priming. Through a firing hole, located at the side of a barrel, the flame, which was created in a cup, reached the chamber and fired the powder charge. The flintlock was invented around 1570, but it was not until the second half of the seventeenth century that it started to be widely used, instead of matchlocks or circular locks. The resignation of pyrite, used in the circular lock, on behalf of a flint made the construction process much easier and less expensive. What is more, it simplified the operation of these weapons. 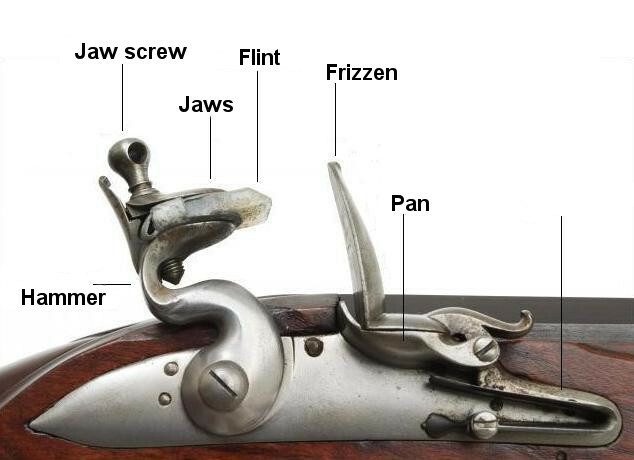 Flintlock was commonly used since the end of the seventeenth to the mid-nineteenth century. Then, it was replaced with a percussion lock and later a cartridge. There were many varieties of the flintlocks, associated with the place of production. Their differences lied in the structure, form and details of the constructional solutions. However, the way to produce sparks was identical in every single type. In this kind of a lock, the main spring's task is to provide the tap where the flint is placed with propulsion. The tap can take three positions: tense, middle and dropped. To keep the lock on standby, the tap must be dragged to the middle position, then a small amount of powder is put on the cup and closed with a cover, which is connected with a tinder in this kind of a weapon. Immediately before the shot, the tap must take the tense position. After pulling the trigger, the tap with the help of a lever falls down along with the flint in the blink of an eye, hitting the surface of a tinder, what initiates a spark. As a result of the striking force, the flint is struck to the front and the cup is uncovered. Thanks to this, a spark can reach the powder without any problem and, therefore, cause an immediate shot. There were many variants of the flintlock pistols, made with different methods which have never been properly defined. Hence, numerous names used by the producers are outdated. The pistols were also produced in very small sizes, which were perfect for self-defence, also for women. The best developed flintlocks were probably found in the pistols used in duelling around the Great Britain. They were extremely precisely made, water-resistant and uniquely solid. The craftsmanship was placed over the external decorations, which were abandoned for the sake of the higher quality of the interior works. These pistols were similar in size to those used by the horsemen. They were sold in pairs, with the addition of all the necessary accessories, packed together in a special wooden box. 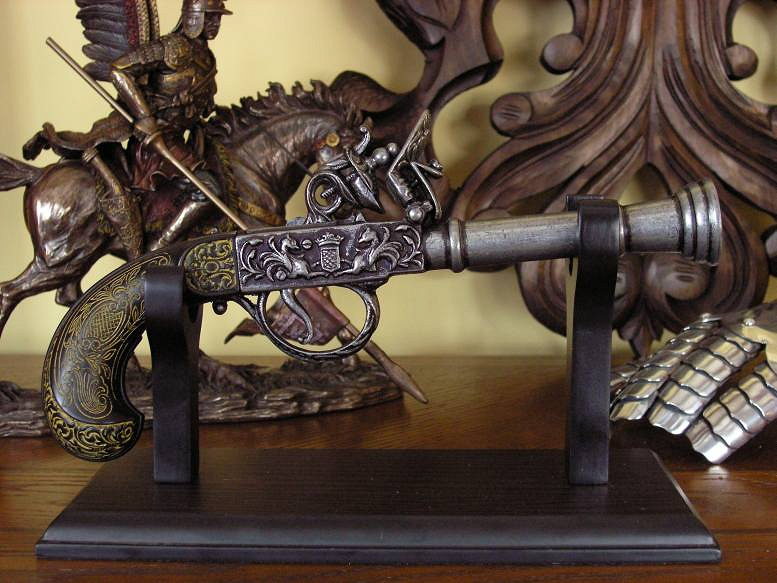 The Global Replicas online store stocks various kinds of weapons' replica, including copies of a flintlock pistol. It will certainly be an impressive decoration of the room or a delightful element of the collection. It perfectly captures the spirit of the age, and enables you to feel the amazing atmosphere of the past. 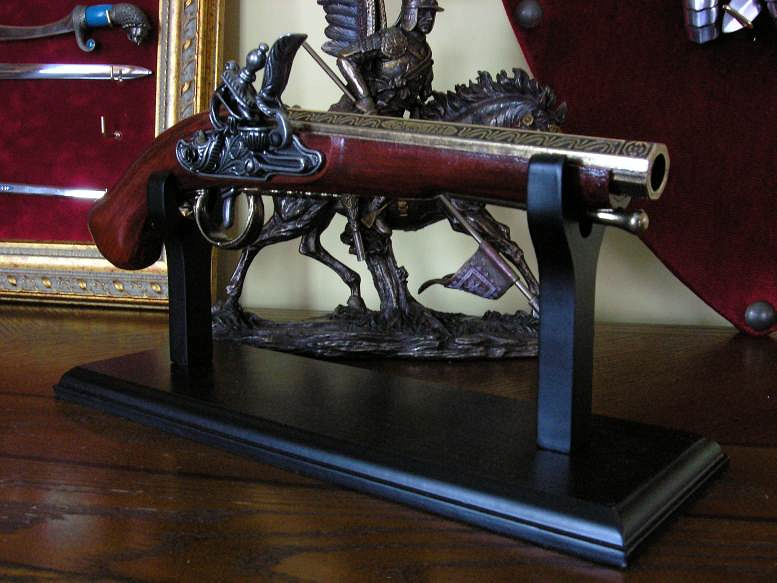 A flintlock pistol replica is a brilliant idea for a gift for every history or firearms lover and not only.